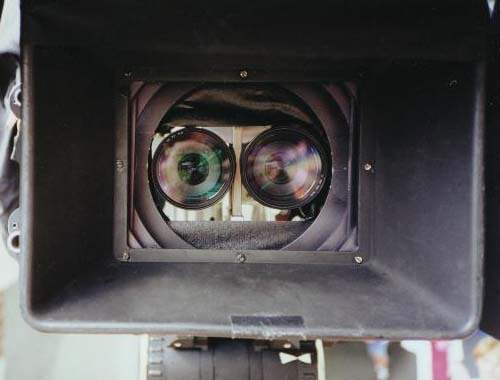 Stereo Camera on Hot Head. GAS3 shoot. 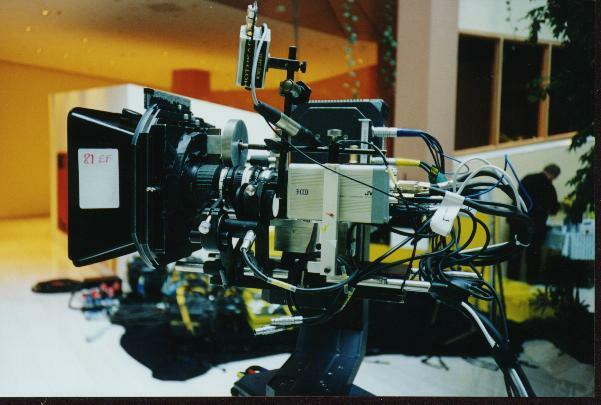 Remote focus motor and witness cam. Viewfinders removed. 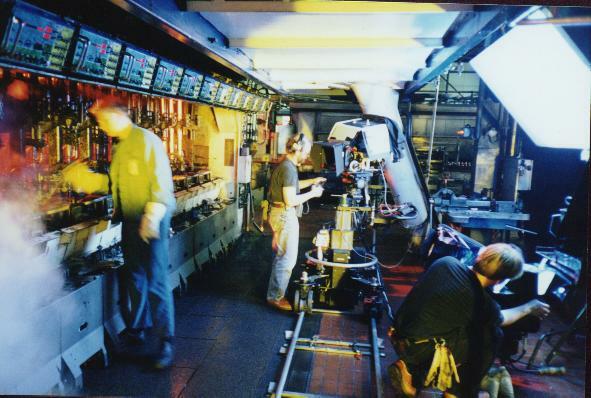 GAS3 is a 10 minutes corporate stereo 3D video produced by Carillon Audiovisual Communication for the Dutch National Gas Company (Gasunie) in 1998. The film was directed by Harry Arp and photographed by me. 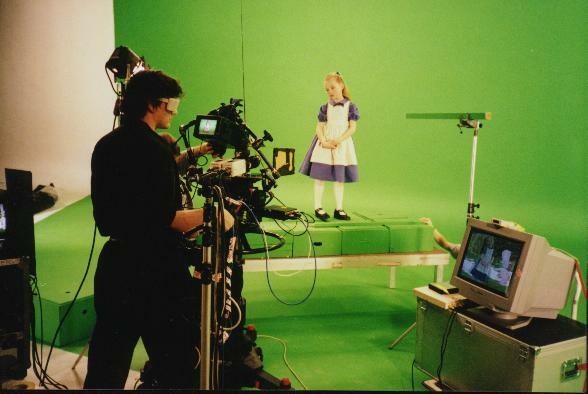 Shooting "Alice in Digital Land" in a stereoscopic Virtual Studio Setup. Note preliminary rendered and (preliminary) composited stereo image on 21" monitor on the side. Pascal Roulin (dir) is wearing shutter glasses. Lots of wires around the tripod head comprise camerahead movement coders feeding camera movement to on-set computers generating stereo virtual background in real time, enabling us to check the composit. 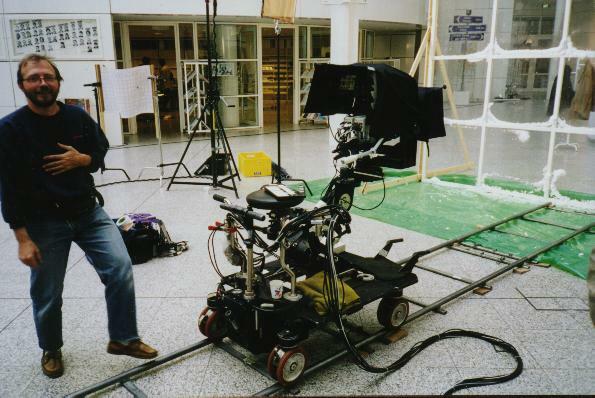 Guy Talin (asscam) with 3dcam on peewee dolly (GAS3). Notice umbilical cable. Exterior setup with viewfinders. 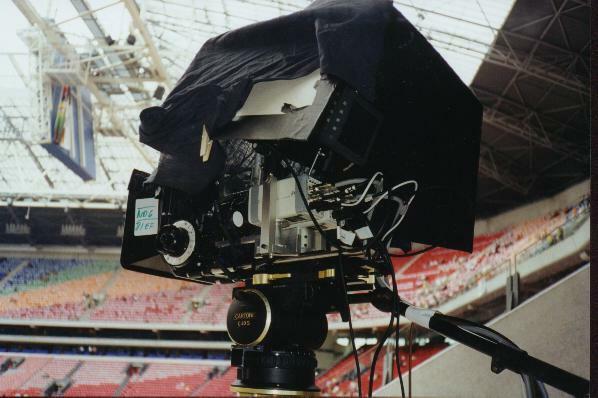 Black cloth protects viewfinder LCD panels from exterior light. A more "finished" housing is being worked on to give to camera a less "prototype" look. Shooting a Hyper stereo shot for a special effect composit. The eyes are 1 meter apart. 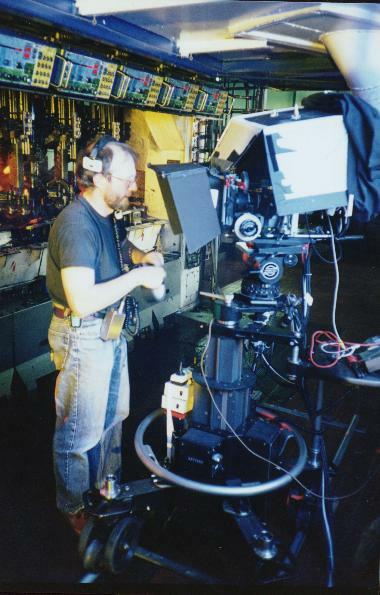 Note the equipment in the foreground. 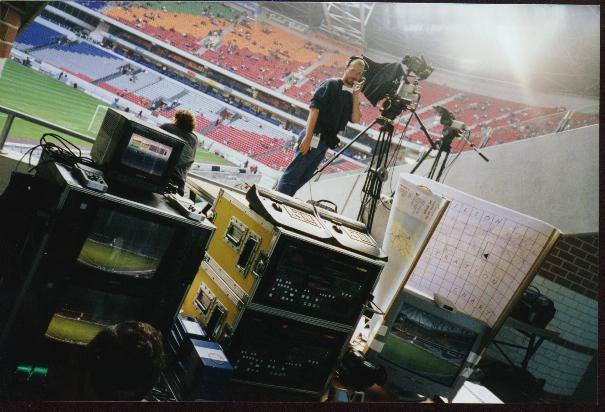 WFM, 2 grade-one reference monitors, dual digi-beta recorders with synchroniser, dual off-line videomixer for stereo composite check, stereo monitor on the right with IR emitter.